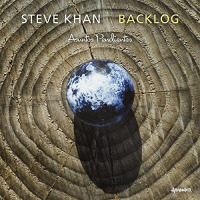 It's been a great couple of years for Steve Khan fans who are (relatively) new to the guitarist's work, especially his early releases, thanks to UK-based BGO Records. First, his '70s-era trio of fusion-centric LPs on Columbia Records, 1977's Tightrope, 1978's The Blue Man and 1979's Arrows, were remastered and reissued in a 2015 two-CD set, Tightrope / The Blue Man / Arrows. As fine as those records are, however, BGO's 2016 reissue of Khan's early '80s triptych, which has come to be known as The Eyewitness Trilogy, represents some of the real gold in Khan's discography. 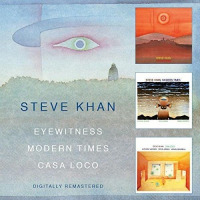 With the three albums collected into this remastered double-disc releaseEyewitness (Antilles, 1981), the live Modern Times (Passport, 1982) and Casa Loco (Antilles, 1983)Khan introduced a major paradigm shift in his entire musical approach that continues to inform his music to this day. 2018's Public Access / Headline / Crossings picks up the Eyewitness story six years later and is another collection of mined gems. The two-CD set collects (almost) two full albums, plus half of another that was originally split between Eyewitness and an acoustic trio. One track from the groove-heavy Public Access (GRP, 1989), which occupies most of the first CD, is unfortunately omitted due to time restrictions since the first disc of this current set already clocks in at 77 minutes, and the second at 79. As beautiful as Eyewitness' rendition of "Dedicated to You" isand despite its significance as the first song Khan ever included on one of his albums that was co-written by his renowned father, Sammy Cahnin keeping with the rest of Public Access' focus on original material, it was the logical choice to drop. The three Eyewitness tracks from Headline (Polydor/Mesa/Blue Moon, 1992) are split over the two CDsand this time, again due to time restrictions, are not presented in their original running order. 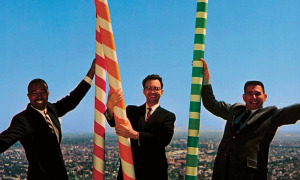 Headline, as a whole, continued another major shift that Khan introduced on Let's Call This (Mesa/Blue Moon, 1991): beyond working with an all-acoustic trio (Ron Carter and Al Foster, who return for Headline's other half), original material was kept to a minimum. 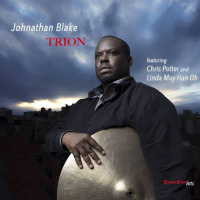 Instead, Khan turned to a career as an astute and individual interpreter of Great American Songbook standards and jazz covers from composers like Ornette Coleman, Wayne Shorter, Joe Henderson and Thelonious Monk that continues to this day, with the sole exception of the more predominantly Khan-penned Parting Shot (Tone Center, 2011). Crossings (Verve/Polygram, 1994), the third album in this collection, is presented in its entirety and continues Khan's shift away from original material to imaginative covers, but this time entirely within the context of Eyewitness. The original EyewitnessKhan, drummer Steve Jordan, contrabassist Anthony Jackson and percussionist (and sometime vocalist) Manolo Badrenaceased working together in 1985 for a variety of reasons. Beyond Denon's 1987 release, Local Color (a duo set with keyboardist Rob Mounsey), and the Japan-only, largely "best of" Helping Hand (Polydor, 1987), the years between Casa Loco and Public Access may have been quiet for Khan the leader but they were, nevertheless, busy years for the in-demand guitarist. During that time, in addition to touring with keyboardist Joe Zawinul's post-Weather Report band Weather Update, Khan recorded and/or gigged with a variety of artists ranging from Aretha Franklin, Ben Sidran and Michael Franks to Bob James, Diane Schuur and Miles Davis. Given Local Color's significantly altered (and appealing) approach, where Khan engaging with Mounsey's drum machine-driven, synth-heavy explorations, the return of a slightly altered Eyewitness lineup on Public Access was most welcome. Jordan was gone, having hooked up with Rolling Stones guitarist Keith Richards' X-Pensive Winos, amongst other ventures; in his place, the virtuosic Chick Corea Elektric and Akoustic Band drummer Dave Weckl. As much as Public Access absolutely felt like an Eyewitness recordincluding the wordless (or words known only to him) vocals that Badrena introduced throughout much of Casa Locothere was, however, change in the air. First, the guitarist's interest in Latin/AfroCuban rhythms, already in evidence throughout The Eyewitness Trilogy (and, truthfully, alluded to even earlier with his three albums for Columbia), had become even more dominant in the intervening years, with Public Access continuing Khan's hybridization of rhythms like the cha-cha with back-beat driven grooves on the captivating opener, "Sisé," and slightly more relaxed "Mambosa." Public Access also demonstrates Khan's clear interest in returning to traditional swingalbeit, as ever, in a wholly modern contexton the fiery "Blue Zone 41" and fluctuating tempos of "Butane Elvin." 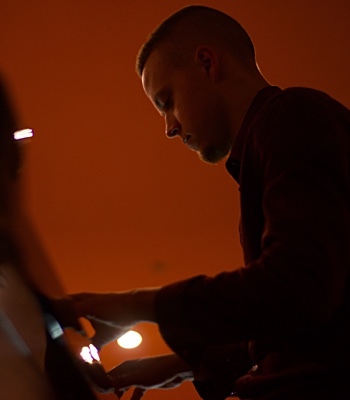 Khan's interest in color and reverb/chorus-drenched atmosphericsparticular evident on "Silent Screen," "Botero" and the album-closing "Mama Chóla"had expanded even further with the introduction of a harmonizer, allowing Khan to layer harmonies over his primary guitar lines in real time, as he does during his solo on "Sisé." Amongst Khan's greatest strengths, in particular following his three Columbia recordings, has been an avoidance of any signatures or techniques. Yes, for example, he has and uses a whammy bar to great effect on Public Access' "Botero People," but it's something he uses sparingly, and only when the moment absolutely calls for it, rather than relying on it as a consistent signature. Khan had evolved from the chops-heavy fusion guitarist of Tightrope / The Blue Man / Arrows to a more considered, almost pianistic (but still chops-capable) player with his landmark 1980 solo record, Evidence. 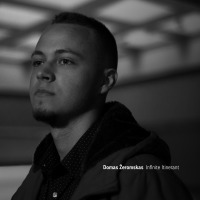 There, he applied layers of acoustic and electric guitars to create vivid and inimitable interpretations of music by Shorter, Zawinul, Lee Morgan, Randy Brecker and Horace Silver, along with a truly career-defining, side-long Thelonious Monk medley. It was this Khan who introduced the concept for Eyewitness, whose approach would continue and evolve, and ultimately imbue other projects throughout the rest of his career. If anything, Khan's guitar gymnastics and light-speed phrasings have become all the more effective for the greater care with which he uses them. 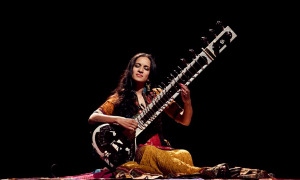 In the post-Evidence world, nothing about Khan's playing could ever be considered superfluous; instead, every note counts, every note matters. 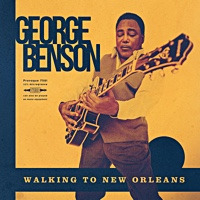 Whether playing Khan originals, music culled from studio jams recorded during the Casa Loco sessions and reworked into "Sisé," the funkier "Kamarica," "Botero People" and "Mama Chóla" (and, consequently, compositionally co-credited to Khan, Jackson, Badrena, Jordan and Weckl), or jazz and Great American Songbook standards, Eyewitness remains instantly recognizable, across The Eyewitness Trilogy and the three recordings represented on Public Access / Headline / Crossings. Beyond Khan's tasteful use of a warmer Gibson ES-335 and more crystalline ESP Strat (the latter used, following Public Access, primarily for overdubs on the group's subsequent releases), Eyewitness' sound was quickly established and clearly defined, irrespective of who occupied the drum chair. 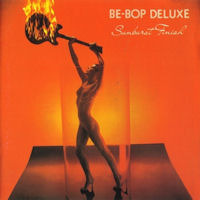 Throughout its five-and-a-half studio albums and one extraordinary live albuma complete 1994 trio show (without Badrena), rescued from Germany's WDR radio archives, and released as The Suitcase (Tone Center, 2008)it became, however, impossible to imagine Eyewitness without the dominant (but never domineering) presence of Anthony Jackson. Jackson's ability as both groove-meister and contrapuntal foil for Khan, while always seeming to choose the absolutely perfect note for the moment, renders him essential to the Eyewitness sound, with a tone paradoxically muscular in its bottom end and bright enough, in its upper registers, to cut through everything and find its way to the forefront. 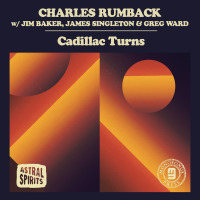 Curiously, Jackson has always been loathe to solo, so Khan and Chambers had to employ a bit of friendly "faking out" to get what is a staggering duo with the drummer at the start of Headline's amiably swinging cover of Ornette Coleman's "Turnaround." The two also spar with some incendiary interplay at the conclusion of Khan's mambo-infused look at Joe Henderson's "Caribbean Fire Dance," which Jackson thought would fade...and does, but not until after his in-tandem feature with Chambers. 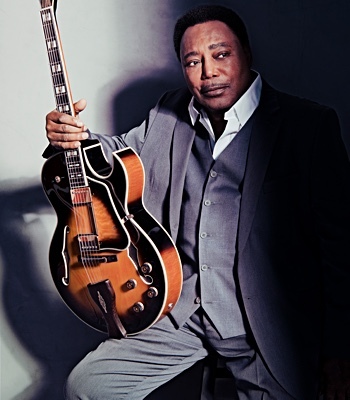 Jackson, too, seems capable of being joined at the hip with Khan, no more obviously than during the guitarist's solo on "Turnaround," where the contrabassist seems completely attuned to the guitarist's improvisational mindset: mirroring figures and echoing rhythmic passages with rare telepathy. Badrena, too, helped forge Eyewitness' unique language and sound world. Whether using an array of acoustic percussion instruments or, beginning with Casa Loco and even more dominantly on Public Access, introducing then-nascent electro-percussion like Pearl's Syn-cussion, Badrena was, in many ways, the band's "X-factor," keeping everyone on their toes with completely unexpected injections, alongside more scored percussion parts. And, while he'd been heard singing on Weather Report's 1977 mega-hit Heavy Weather (Columbia), with Eyewitness it evolved into something even more unpredictable, even when singing pre-conceived lines on songs like "Kamarica" and "Mama Chóla," both also featuring four additional vocalists layered alongside Badrena. That's not to suggest that Eyewitness' three drummers didn't bring their own voices to the party. Weckl, in his early days with Chick Corea's Elektric (and, later, Akoustic) groups, was frighteningly virtuosic and possessed of such impeccable time that he could have almost been considered the jazz version of Neil Peart (from Canadian progressive rock band Rush). 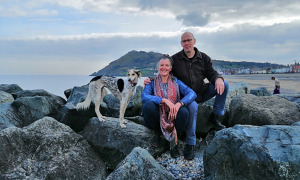 But by the time he was enlisted for Eyewitness, the drummer had evolved considerably, finding ways to balance his still-impressive technical acumen with greater feel, making him a great choice for the group. With the band rarely able to tour outside of New York and Japan, however, the Weckl incarnation of Eyewitness was short-lived. Khan, for reasons of both interest and practicality, moved to the acoustic trios of Let's Call This and half of Headline. But with Dennis Chambers' recruitment for the Eyewitness heard on Headline and Crossings, Khan had a more tour-capable group. 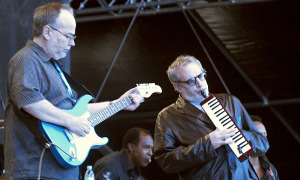 Chambers had already established a significant reputation, first with the P-Funk All Stars, then as a member of guitarist John Scofield's acclaimed, fusion-heavy quartet responsible for three Gramavision records in 1986-87, and then as a member of the reunited Brecker Brothers in 1992. But as mind-blowing as Chambers could be, he'd never engaged in a group with such decidedly Latin leanings and, by the time he joined the group, disposition towards interpretation rather than original compositionthough Crossings did present two new Khan compositions in the mambo-informed "Descarga Khanalonious" and greasy, funkified shuffle of "What I'm Said." 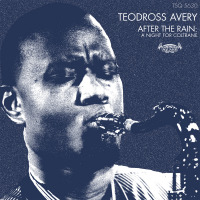 Still, Chambers proved himself capable of swinging like a mo'fo' on "Turnaround" or engaging in a booty-shaking, 6/8 bembe rhythm with Badrena on Crossings' closer, a version of Bronislau Kaper and Gus Kahn's "While My Lady Sleeps." Even Cole Porter's evergreen "I Love Paris" is reinvented with a combination of Badrena's clave, Khan's montuno accompaniment and Chambers' irrepressible energy. 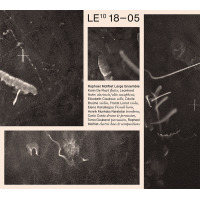 Yet to be mentioned, however, is one other aspect to Crossings that separates it from all the other Eyewitness releases: the appearance of saxophone great Michael Brecker on three tracks: the opening "Descarga Khanalonious," "While My Lady Sleeps" and, most notably, "I Love Paris," where Brecker's solo begins with everyone in the pool but turns even more fiery when Khan and Jackson drop out, leaving the tenor saxophonist to soar and sear, with only Chambers and Badrena driving him, before the rest of the band returns and he winds his way through the song's changes, visceral yet ever-respectful of its foundation and heart. 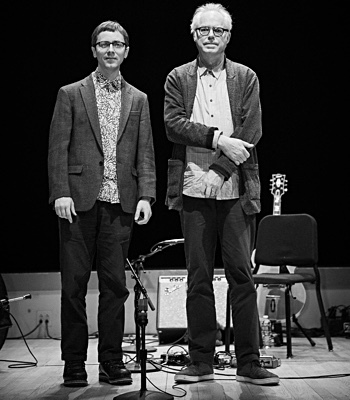 Bill Milkowski, in his exceptional liner notes, details Khan's reminiscence of Brecker's funeral (passing, all too young, in 2007 at the age of 57): "Says Khan, 'I remember Pat Metheny saying "There is practically nothing more daunting for a musician than to have to follow a Michael Brecker solo." I know exactly what that feels like!'" Still, if based on nothing but his own solo on "I Love Paris," Khan needn't worry, as he delivers a solo predicated on rapid-fire, bop-infused lines, peppered with chordal injections and lengthier harmonic passages. And yet, as busy as everyone is on this track, with the possible exception of Jackson, who hold the whole thing together as a fluid but unshakable anchor, this is music that never approaches excess. Instead, even at its densest and most frenetic, everything still makes perfect sense. Eyewitness is often lauded for its unique (especially for its time) language and approach, deeply felt grooves and stellar playing. Still, the group's telepathic ability to engage with one another on a profound level must not be overlooked, its intrinsic conversational ability a definitive one, whether on a buoyantly Latin-zed version of Monk's "Think of One," an even brighter "While My Lady Sleeps," or a deeply beautiful, balladic look at Lee Morgan's "Melancholee," all from Crossings. Khan, more than many guitarists alive today, demonstrates remarkable knowledge and breadth when it comes to the jazz and Great American Songbook traditions. He selects material dating as far back as 1939 with Jack Lawrence and Arthur Altman's "All or Nothing at All"originally a hit for Frank Sinatra four years later, when it was reissued during the 1942-44 musicians' strikeinterpreted here with a firm but pliant bolero/cha-cha pulse. 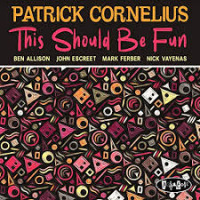 He reinvents more modern fare, too, like his atmospheric take on Tony Williams' "Pee Wee," first heard on Miles Davis' Sorcerer (Columbia, 1967), or his son montuno reinvention of Shorter's "Capricorn," from the Davis alum's more outward-reaching album Super Nova (Blue Note, 1969). 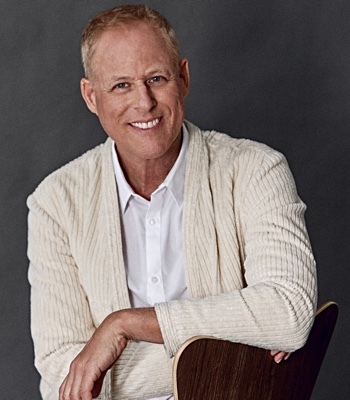 He also bucks tradition with his version of Cahn's collaboration with regular partner Jule Styne, "It's You or No One." 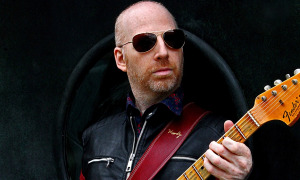 More often than not interpreted as a barn-burner, here it's taken at a comfortable mid-tempo, its Brazilian-tinged interpretation once again based on the cha-cha groove that sets a perfect foundation for Khan's lengthy but ever-focused guitar solo, filled with motivic invention, intervallic leaps and more. Of the three albums represented here, only Public Access has been remastered, with a bit more emphasis on the bottom end than the thinner-sounding original. Headline and Crossings come from the original masters. 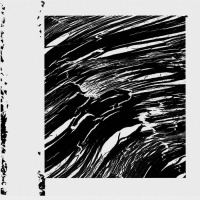 Like ECM Records, when it reissues some of its older titles in box sets without remastering, the old adage "if it ain't broke don't fix it" applies here, too. Khan says, in Milkowski's liners, that ..."all the great jazz albums have two thingsmood and attitude." There's no denying that Eyewitness has both...in spades. 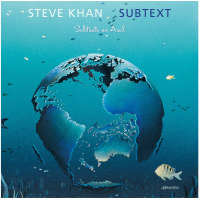 With material ranging from just under five minutes to, on just a couple occasions, a little over ten, Khan and his group nevertheless approach the music with a lovely sense of relaxation, often taking more time than usually allowed on studio albums, to develop the mood before finally getting to themes and the heart of the matter. 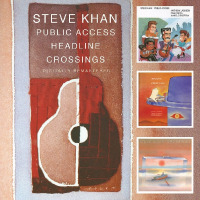 Another collection of gems from a guitarist whose name has cachet, but nowhere near as much as he deserves, Public Access / Headline / Crossings continues BGO Records' reissue program of Khan recordings that were previously (and criminally) out of print. Perhaps the label might consider reissuing Evidence, along with the one-and-a-half albums featuring Khan's acoustic trio with Carter and Foster (an argument could be made for placing them together in a package, despite being separated by more than a decade). 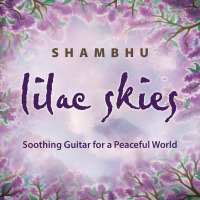 Guitar geeks and many others would, no doubt, appreciate having access to these fine albums. In the meantime, fans old and new can rejoice that, since 2015, the majority of Khan's work between 1977 and 1994 is now back in print, with fine liners and, where necessary, upgraded sound. If The Eyewitness Trilogy introduced a group whose concept was innovative at the time and remains so today, the essential Public Access / Headline / Crossings takes it more than a few steps further, both in its move from original material to imaginative interpretations and in acting as a bridge between the guitarist's earlier recordings and later, even more decidedly Latin-oriented albums like Parting Shot, Borrowed Time (Tone Center, 2007) and Subtext (Tone Center, 2014). Track Listing: CD1 (Public Access, 1989): Sisé; Blue Zone 41; Kamarica; Silent Screen; Mambosa; Butane Elvin; Botero People; Mama Chóla. (from Headline, 1992): Turnaround; Caribbean Fire Dance. CD2 (from Headline, 1992): All or Nothing at All. (Crossings, 1994): Descarga Khanalonious; Think of One; When I’m Said; Pee Wee; It’s You or No One; I Love Paris; Capricorn; Melancholee; Inner Urge; While My Lady Sleeps. Personnel: Steve Khan: guitar; Anthony Jackson: contrabass guitar; Manolo Badrena: percussion, vocals (CD1#1-8); Dave Weckl: drums (CD1#1-8); Lani Groves: additional vocals (CD1#1-8); Vivian Cherry: additional vocals (CD1#1-8); Janie Barnett: additional vocals (CD1#1-8); Kurt Yahjian: additional vocals (CD1#1-8); Dennis Chambers: drums (CD1#9-10, CD2); Michael Brecker: tenor saxophone (CD2#2, CD2#7, CD2#11).